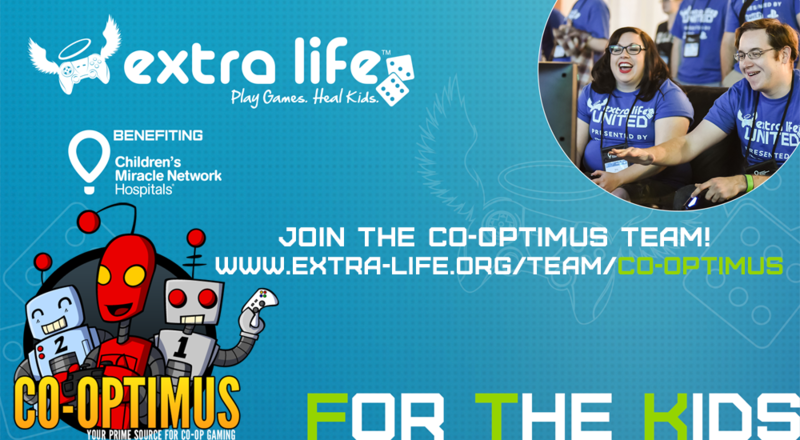 Co-Optimus - News - Join Us For Extra Life 2017! Play games and help kids? That's basically the definition of win-win. My trusty old Webster dictionary even says so. Well, okay, maaaybe I wrote it in the margin, but seriously, fundraising doesn't get much better than this. It's super easy to sign up. Just head on over to our team page and click "JOIN OUR TEAM" (or just click that link). Answer a few easy questions and you're in! You have the option of participating as a Classic or Platinum participant. If you choose Platinum, you'll be eligible for cool prizes and rewards for hitting fundraising milestones. It'll cost you $15, but trust me, it's worth it. Classic membership is free but you'll miss out on the prizes. Both options come with the best feature... You're helping sick or injured kids who stay at the hospital you choose. All donations you receive through your page will go straight to the hospital you pick. You could pick your local CMN Hospital, or you could pick a hospital in a city that has been hit hard recently by disasters. Between all the hurricanes, fires, and the unspeakable pure evil tragedy in Las Vegas, there are plenty of hospitals in those areas to choose from. The hospitals could spend the donations on new equipment, or to help families who can't afford to pay for the treatments their child needs. Game Day this year is on November 4th, so mark your calendars and start raising donations! If you can't devote the entire day, or you're busy on November 4th, no problem! You can always pick different day or play for a few hours across several days. The Game Day is meant to be a celebration and not a requirement. The important part is that we're raising money for kids in need. We'll be streaming on our Twitch channel all day on November 4th, so be sure to stop by and chat with us. We'd love to catch a game with you too, so let us know what you'll be playing and we'll try our best to fit you into our schedule. Please consider joining and donating to Extra Life! For The Kids! Page created in 0.5822 seconds.